loco-men being forced out of the industry. 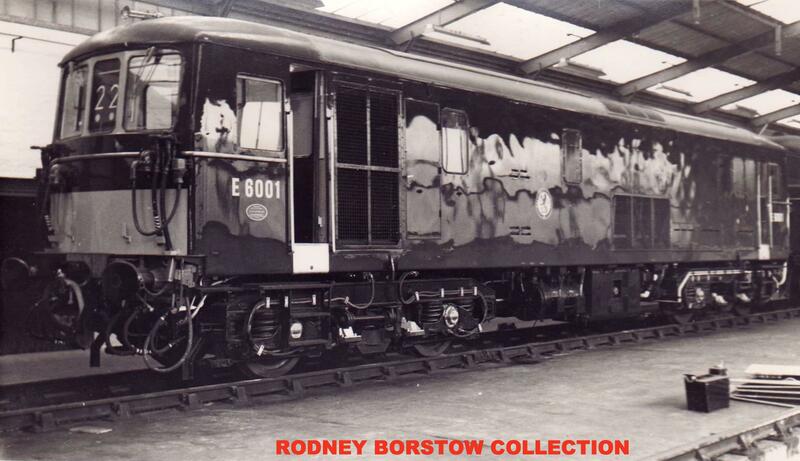 Driver on a diesel or electric traction unit. prolonged than in fact was the case. this matter, it could have been settled a long time ago. schemes should be discussed with the Trade Unions. later to the anomalies arising from this. 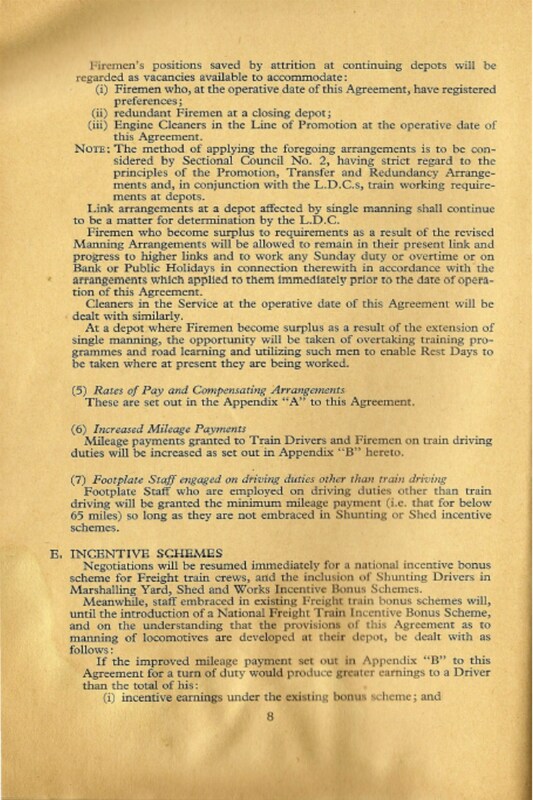 the proposals put forward in January 1963.
of the manning of the traction involved. is promoted to Fireman and eventually becomes a Driver. to the safe working of his train. are set out in Appendix “C”. which the Railways' proposals will Impose upon the Driver. 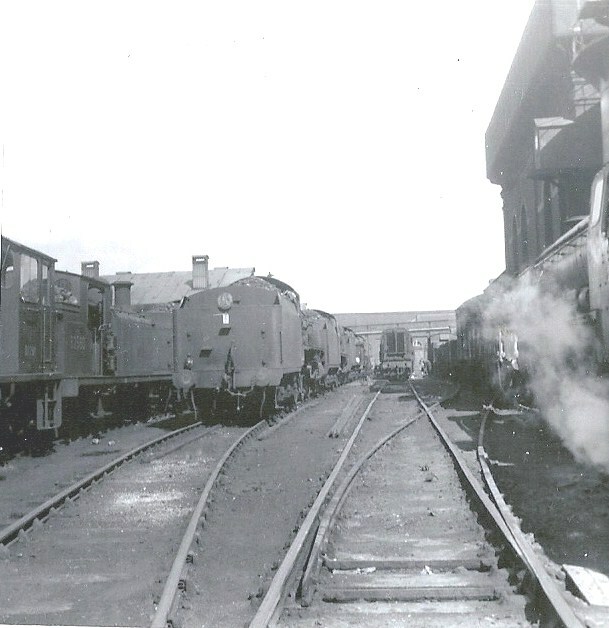 connection with diesel or electric locomotives which work passenger trains (including parcels and empty stock). driving single-manned; and to a non-stop distance of 125 miles as against the present 100 miles. midnight and 2.0 a.m., and trains scheduled to commence between 4.0 a.m. and 6.0 a.m.
time not exceeding 2 1/2 hours. held on 6th of this month, concerning the extension of single manning. I would like to explain why we feel that our proposals should be the maximum of any extension of the Manning Agreement. limitation of continuous duration of driving single-manned. Railways in so far as their own proposals vary in this regard. upon to work single manned. miles or seven hours per turn of duty, and a non-stop running time of 21/2 hours. train, whereas Management desire a limit between 100 and 175 miles. provided with a second man. hours demanded of a Driver working on his own. in fact far more important to the safe working of the train than the Guard. obtained by a Driver from having a second pair of eyes to assist him In his arduous and most concentrated duties. kind in Circumstances which have warranted such a course of action. interests of all concerned. I suggest that agreement could no doubt be reached in this connection. in the light of medical evidence. does not contribute to safe working, to run trains during the night hours with only one man at the front end. in fact been stated that a man who is regularly rostered on shift work is not affected by tiredness during the night time. His work is not on the shift basis as generally understood namely 6 0 a m 2.0 p.m. and 10.0 p.m., or similar hours. 'week. Thus there is no regular pattern m the normal sense of shift work. and other sources which are not normally so evident at night time. in general it is unjust and unsafe to single-man trams during the night period in question. the principle of double manning during the night hours. This is our grave concern, and there is no question of our seeking to retain men who are not needed. underling this arrangement should continue in operation. adequate break of 30 minutes for this purpose and to allow him to take his meal. hour) should be subject to agreement between the headquarters of the Region and the Trade Unions. service and cover all the turns of duty by adult staff. adhere to the spirit and- Intention of the arrangement in question. order to ascertain whether or not they could suitably be amended. 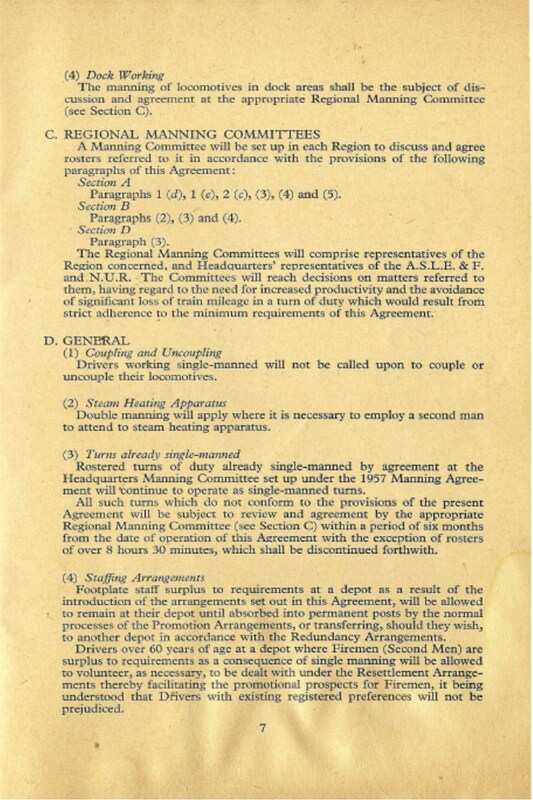 Manning Agreement was introduced; and they do not appear to have experienced any difficulty in that connection. organisation that the majority of the Railways' proposals are essentially bound up with the question of rostering. with the proposals put forward by my Society. they would develop an outlook which does not exist amongst these most conscientious men today. the scope that is desired or is necessary. undoubtedly take undue advantage of the position. of, say, a distance of up to 40, 50 or even more miles. sense from a main-line point of view. and off points. 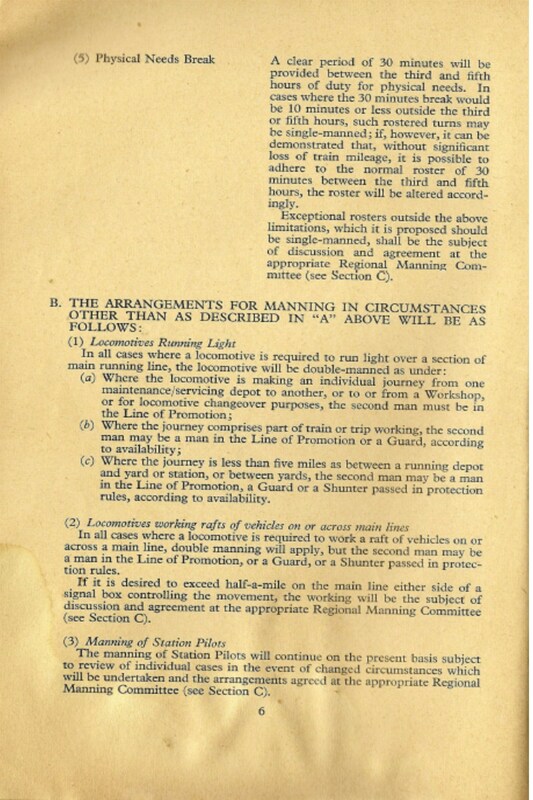 These points will, in most cases, be adjacent to the Marshalling Yards where the locomotives will be stationed. It therefore follows that with proper rostering the trains can commence and terminate where the locomotive is berthed. or dieselised-and I am sure the Board will agree that this is so. the line of promotion to accompany the Driver to the traffic yard. have no objection to discussing, any particular case with the Region. to the proposals on Dock Working, which are in line with the present arrangements. With reference to coupling and uncoupling, and to steam heating apparatus: here again we have no quarrel with the Railways. train at the same time. I need say no more on either of the two points as we fully concur m this section of the Board's proposals. 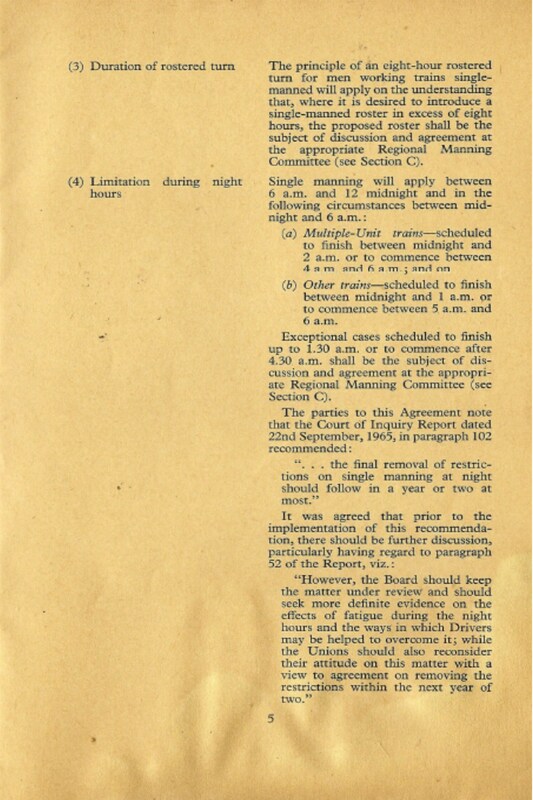 introduction of a relaxation of the Manning Agreement. Furthermore, the closing of depots and transfer of work from one depot to another is causing great hardship to our members. extreme difficulty in travelling to work at their new depot. with 30 and 40 years' service finding it necessary to leave the service. payment, although the savings to the Railways must have amounted to many millions of pounds per annum. Driver are receiving as much or, in some cases, more wages for an 8-hour day than the Driver. technical knowledge arid the experience required of a Driver. could actually result in a substantial increase in earnings by way of bonus payment. duties and receive upwards of 18s. as an additional payment. increased productivity, and continue to do so. traction and be repaired to perform minor repairs (they get no extra payment for this additional knowledge). loads of individual customers' products and 1,000 of them have a payload of 500 tons each. carrying full loads. Payloads on these trains amount to as much as 1,200 tons a train. The Railways have introduced "Export Express" services, giving a "next day" delivery to the major ports. introduce trains of this type with a carrying capacity of 125 motor cars, travelling at speeds of up to 75 miles per hour. This is true productivity, separate and apart from any reference to the Manning Agreement. many years' service and experience behind him. 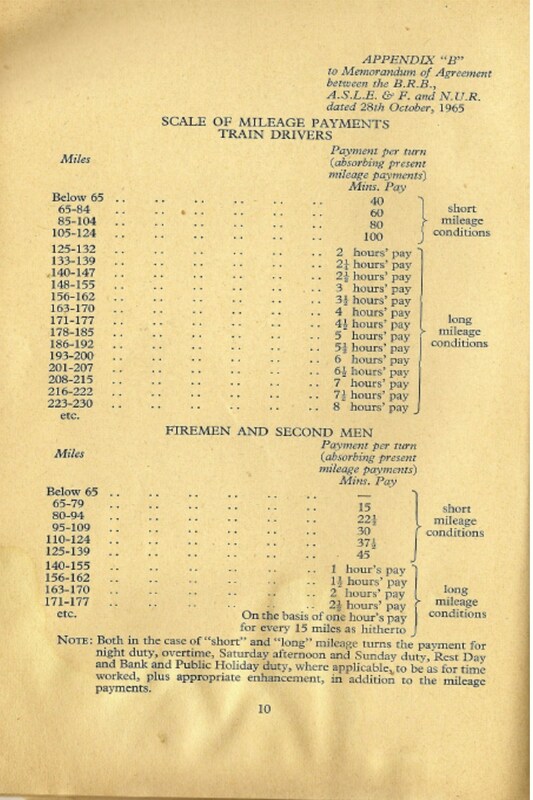 overtime, a higher payment than a main-line Driver. he is engaged on productive work; he should be paid accordingly. a position is frankly untenable. week more than a Train Driver. staff but by ensuring that they are more continuously employed and ineffective work reduced. performance the balance of one-third. respect to train running, and therefore greater productivity. bonus to the remaining staff amounting to £94,000 which gives an average weekly bonus of over £2 per week to each man. the Railways; the staff here again receiving almost £2 per week by way of bonus. work 100 miles instead of 65 miles, he receives an extra 1s per day under the present mileage agreement. increased earnings (this was four years ago, and the rates have probably increased substantially since then). improvement of 75 per cent in timing. 105 miles. For this increased mileage he would receive the princely sum of 1s. 6d. 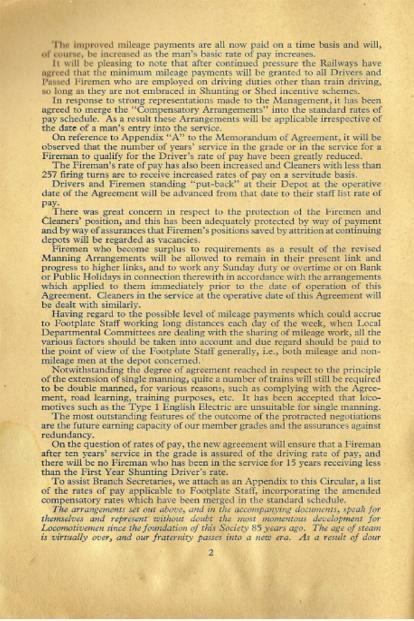 under the present Mileage Agreement. considerable economy in operating costs and have provided increasingly accelerated services over the last five years. the retraining of Footplate Staff. are surrounded by staff in other grades, doing less responsible work, who are recompensed for higher productivity. on the Railways during the last year or two. I would like to take this opportunity of quoting extracts from this book. 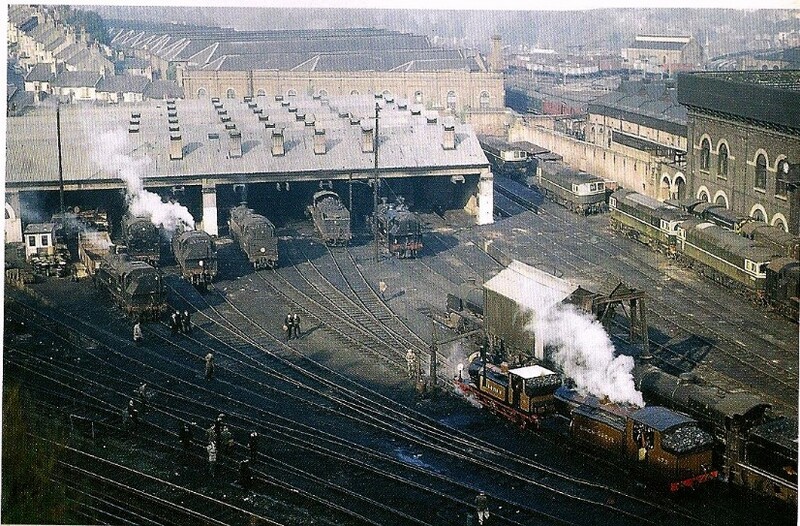 the more productive use of locomotives, carriages and wagons. and shorter journey times. The proportion of coaching train miles run by diesel and electric traction rose to 87 per cent. to make start-to-stop journeys at 60 m.p.h. or more, including 25 averaging 70 m.p.h. or over. and Clacton, Frinton and Walton cut up to 28 minutes from the journey times on this comparatively short route. withdrawn, the booked weekly mileage of fitted and partially fitted trains rose to 59 per cent of the total. hauling a gross load of 2,000 tons between Southampton and Birmingham is currently the heaviest train in the country." productivity in no small way. 50,472; a reduction of 2,887 or 5.4 per cent in six months. 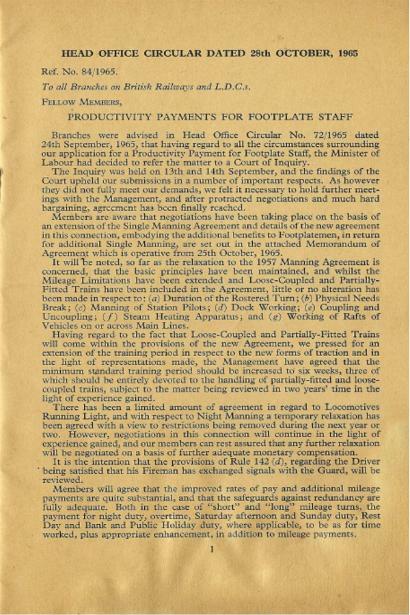 establishment of Firemen and Cleaners has decreased from 28,744 to 19,299, a reduction of 9,445.
attention to the numbers of Footplate Staff on British Railways in 1957 when the present Manning Agreement was introduced. 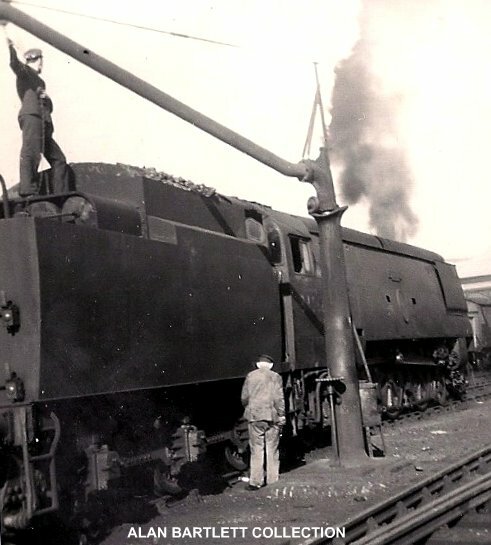 There were 83,157 Footplate Staff on the Railways at that time-there are less than 50,000 now. particularly having regard to the fact that bonus schemes for certain other grades have been in existence for some time. In five years' time over 11,000 Drivers will have left the service by way of normal retirement. positions, making a saving of over £2 million per annum. individual member of the staff. disappear following amendment of the Manning Agreement. A number of Drivers' positions would also be absorbed. week, or over £13 million per annum. £4 million, giving a total saving of £9 million by way of a relaxation of the Manning Agreement alone. '" Staff, our proposals in relation to additional payments are on a very modest scale indeed. payments referred to in my Appendix "D", and not to the payments as set out in Appendix "D" to the Minutes of the R.S.N.C. Sub-Committee meeting held on 6th September. 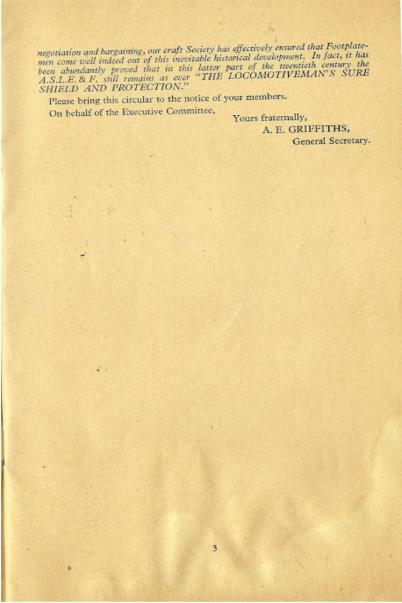 "C" to the Sub-Committee Minutes of 6th September. Appendix "B") are withdrawn if a relaxation in manning during night hours is not accepted. bears no relation to the additional savings which would accrue if there was a relaxation in manning' during night hours. productivity of our member grades. readiness to match our own proved willingness to move. proper share in the benefits accruing from increased productivity. 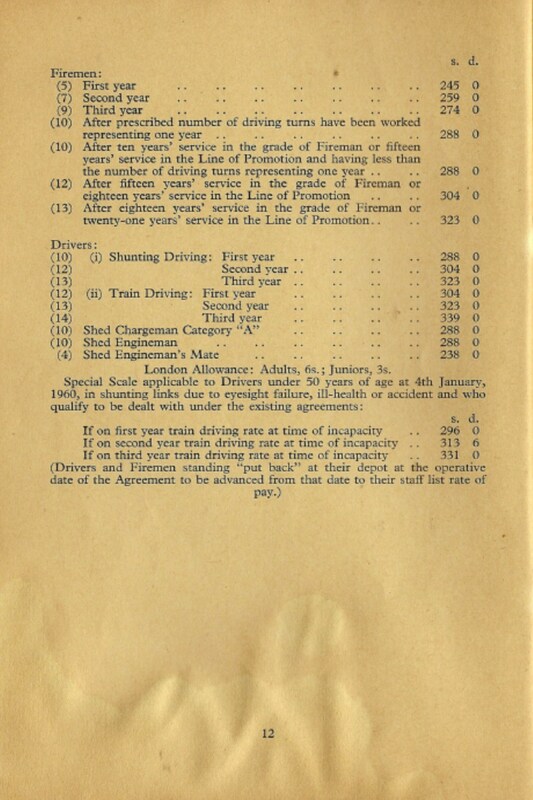 member grades; and (c), of a reduction in the Board's proposed limit on the amount of driving single manned per turn of duty. 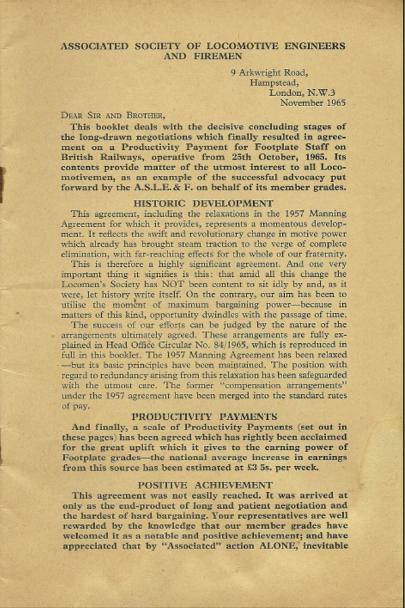 "A" Diesel and Electric Manning Agreement-Memorandum of Agreement dated 18th December, 1957. "B" L.M. Region: Incentive Bonus Schemes-Freight Train and Trip Working. "C" A.S.L.E.F. 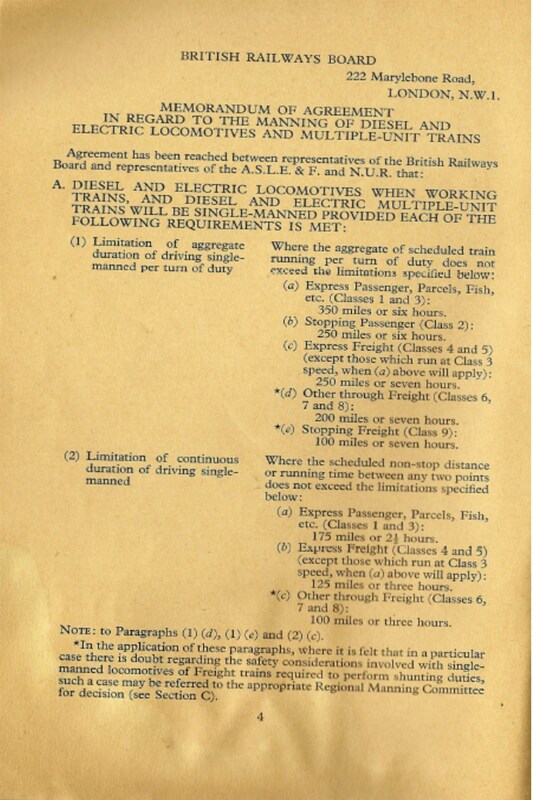 proposals-Diesel and Electric Manning Agreement. "D" Scale of Mileage Payments: Railways' Proposals-A.S.L.E.F. Proposals. N.U.R. 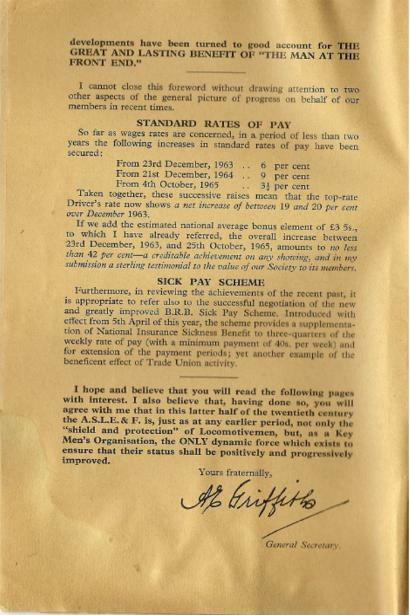 on 18th December, 1957, and A.S.L.E. 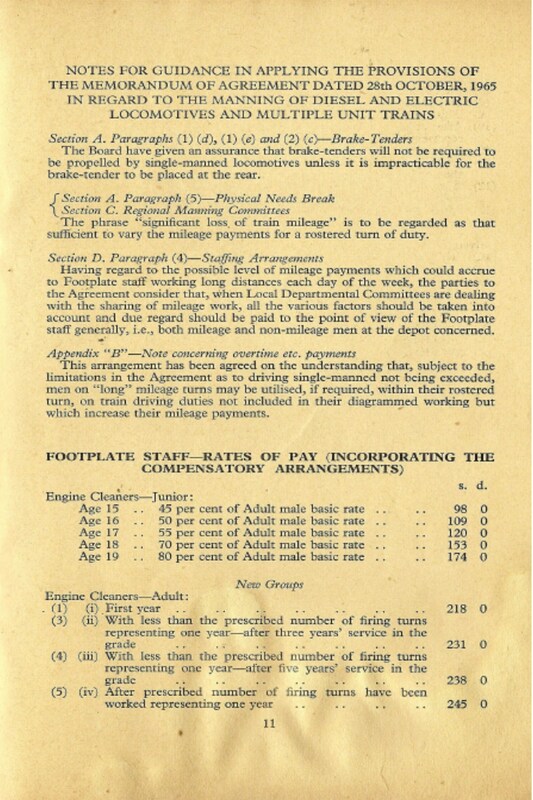 & F.'s claim for a productivity payment for all footplate staff." which were fitted with automatic brakes throughout. A.S.L.E. & F. had originally pressed for this restriction to be maintained. such should not be single-manned. negotiation. For my part, I think the Board's proposals are reasonable as they now stand. 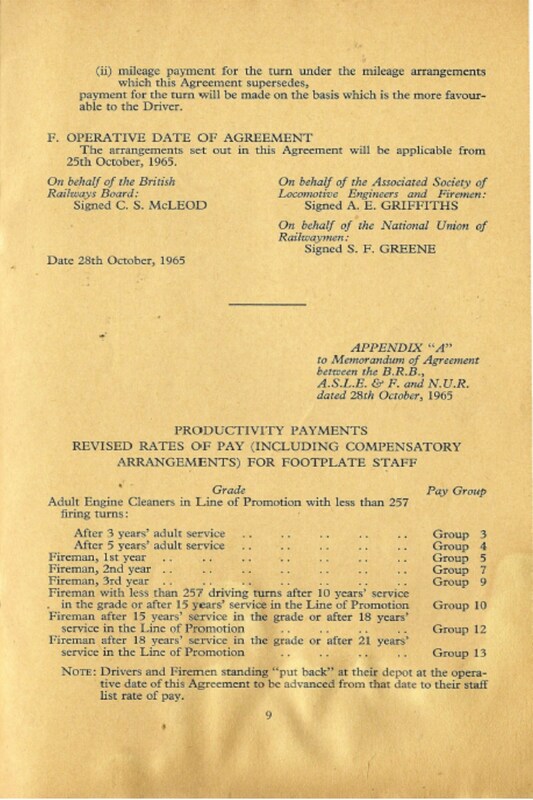 coupled with an offer on 6th September 1965, of a much lower scale of mileage payments." ": .. I recognise, and I think the Board also recognises, the very strong feelings which the footplatemen have on this issue. joint committees at regional headquarters, any relaxations, of course, being subject to agreement by both sides. their attitude on this matter with a view to agreement on removing the restrictions within the next year or two." stress that the regional committees must be made to work by both side." to move their homes or travel long distances. 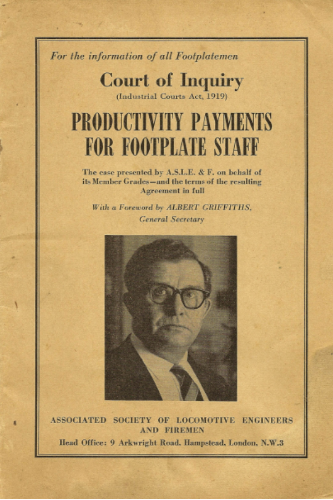 "The Board also gave assurances that the earnings of footplate staff affected by the revised Agreement would be safeguarded .... "
Conclusion-productivity payments . . .
"The Board said that they were prepared to accept the changes which were already capable of agreement and to pay for them. "Given the changes in manning to which the unions seemed prepared to agree at this juncture, what is their just price? difficulty of forming a conclusion without adequate figures." year, and the Board's figures do need re-examination.